At Lake Malawi. From left: Kurt Richter, assistant director of MSU's Global Center for Food Systems Innovation, Amol Pavangadkar, David Poulson and Phillip Chiunjika, their Malawian driver. Communication is key when it comes to sharing innovative research with the world. But for many scholars, and even journalists, communicating scientific information effectively is an acquired skill. David Poulson and Amol Pavangadkar from MSU’s College of Communication Arts and Sciences have been working together on communications training materials for three years. The pair headed to Malawi for a week in early August to train research faculty from Lilongwe University of Agriculture and Natural Resources (LUANAR), along with African journalists, on techniques they can use to better communicate scientific research with each other, and more importantly, with the citizens and farmers of Malawi. Poulson, the senior associate director of MSU’s Knight Center for Environmental Journalism and director of translational scholars at MSU’s Global Center for Food Systems Innovation (GCFSI), spent his week teaching the journalists and LUANAR faculty how to simplify scientific information and repackage it into a straightforward story the average citizen could understand. Pavangadkar, director of Sandbox Studios and a senior specialist within ComArtSci’s Media and Information Department, spent his time teaching the group to bring attention to the research with video, including how to use simple tools, such as an iPhone, to their advantage. At the end of the week, a day-long workshop brought the 39 journalists and 16 faculty together to put their skills to the test. The journalists split into small groups and gathered around each of the faculty members for 10-minute interviews. Armed with the knowledge of what they do and don’t need to communicate about their research, the faculty shared their work with the journalists. 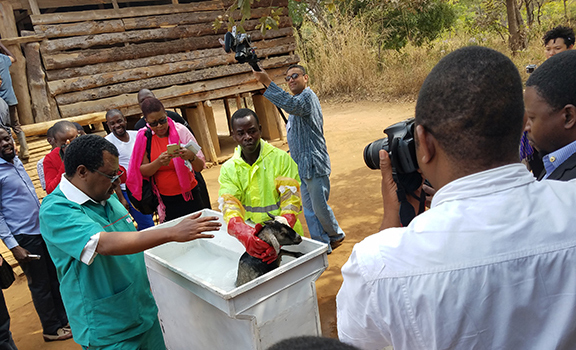 Among the research highlighted was a new practice involving dipping goats into an insecticide bath to kill ticks, a new sustainable drip irrigation system and seed sorting improvements. “The most exciting thing is that I’m finally seeing a real excitement among researchers and scientists to actually get involved and take responsibility for their own communications,” said Poulson. Newly aware of how to decipher scientific research and communicate it clearly, the journalists were able to determine which projects would work best for video, audio and text-based stories. Poulson and Pavangadkar’s short trip was part of a multi-year project dedicated to helping LUANAR faculty develop innovative research under a project called the Innovative Scholars Program. The project aims to help improve the farming infrastructure and practices in Malawi, and encourages entrepreneurship. The ultimate goal of Poulson and Pavangadkar’s training, and the work done by the Innovative Scholars Program, is to share the research by LUANAR faculty into the world and help people learn how to better feed their families. Life-saving research doesn’t help anyone if it’s hidden away in academic journals. 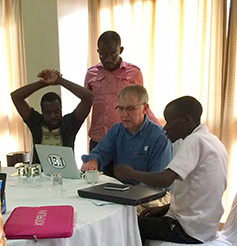 By the end of the training, Poulson and Pavangadkar agreed that both the faculty and journalists were left with greater confidence in their ability to share scientific research with the people who need it most. As part of GCFSI, Poulson started and now manages a multi-media website, The Food Fix, which reports on food security innovations with text stories and podcasts. 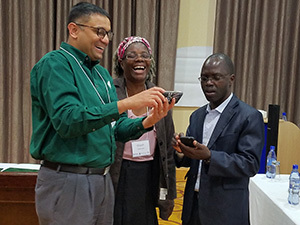 In addition, Pavangadkar’s student team contributes videos and has already shared some of the stories generated from the training in Malawi. The news service has generated enough momentum that the Knight Center is continuing to use it as a teaching, research and communications tool.